Leave chicken marinating overnight covered with cumin and salt. In 1 ltr stock cook chicken with garlic in a covered pot. 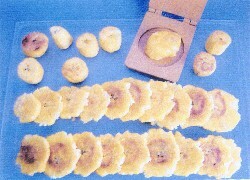 Peel green plantains and slice them in 2 inch pieces. 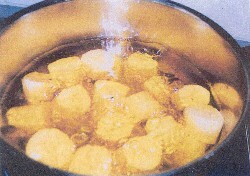 Fry them in med-hot oil until slightly brown, take them out of frying pan and flatten them. 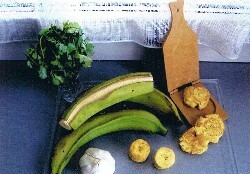 When chicken is cooked, cut it into small pieces, add 2 more ltrs stock, the green plantains and the coriander. Cover and simmer for about 15 min. Check the salt and garlic. 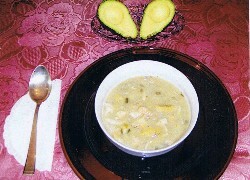 ► Tip: You can add squares of yucca the last 15 min. Eat with white rice and avocado.